Simplified Voiceover pricing is built into the platform providing greater value for Buyers and Talent. 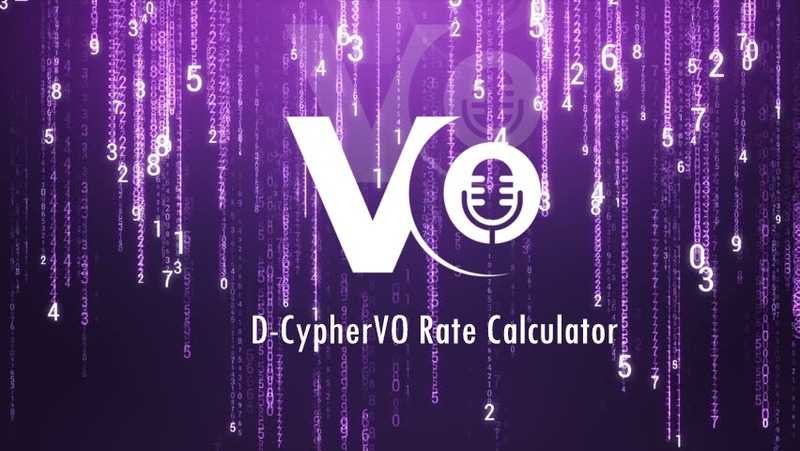 D-CypherVO is a revolutionary, question-based wizard that will allow the voiceover buyer to answer a simple set of queries to get an even simpler answer of “how much” for their voiceover job. For Buyer and Talent, the result is consistency, clear expectations, transparency and ultimately a clean efficiency of transaction. D-CypherVO and VOICEOVERS.com are intelligent technology. They do the (hard) thinking for you. At the root of this is a philosophy of empowerment of the voiceover actor and efficiency and effectiveness for the professional Talent and Buyer alike. This empowerment leads to an elevation of the business at all levels. D-CypherVO is a free tool, a piece of technology viewed as a voiceover market imperative for Voice Casting Hub and VOICEOVERS.com. This initiative is aimed at bringing clarity to a marketplace which is currently rife with confusion. An informed marketplace is an efficient marketplace. D-CypherVO is a new, automated calculator which addresses all of today’s non-union rate hot-buttons. This rate/term wizard fuels a voiceover job with the RIGHT professional voice, compensated based on exposure, a transaction grounded in fairness to all parties. Efficiency, effectiveness and fairness are sustainable and scalable principles which can fuel the ongoing health of a vibrant voiceover market.